Just under a year ago we lost a wonderful, kind and creative soul in the crochet community, Marinke Slump, lovingly known as Wink. Before she left us she was working on a crochet along for Scheepjes, but unfortunately she did not complete the design. 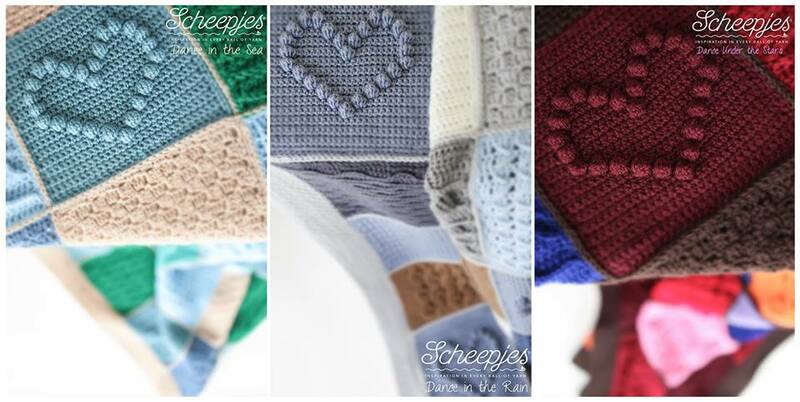 The wonderful people at Scheepjes have taken it upon them to complete one of her last projects and have asked 12 talented designers in the Scheepjes Bloggers group to finish the CAL. The result is Last Dance on the Beach Crochet Along, the Scheepjes CAL 2016. This CAL has kits available in two yarns and in three color ways. You can choose a base kit with Color Crafter yarn or a luxury kit with Merino Soft yarn. The three color ways are Dance in the Sea, Dance in the Rain and Dancing under the stars. Both kits have yarn and a special edition label to add to your afghan. If you choose for the luxury kit you will also get lots of other goodies. And maybe the best part of this project is that 2 euro of each kit sold goes to a charity aimed at helping people with mental health difficulties. We will be making squares during this CAL; some beautiful in their simplicity, others more intricate and detailed. Do not be concerned that this special CAL might be too difficult for you. I will be helping you with step-by-step video tutorials each week to get you through the difficult bits. Due to the nature of this CAL where each square is designed by a different designer, you will have to change hook sizes and take extra with certain squares to get them all to the same size. The Color Crafter blanket will be about 115cm x 150cm, the Merino Soft about 130cm x 160cm. All kits go on sale April 1, 2016 and are available from Paradise Fibers (USA/CA), Wool Warehouse (UK/International), Deramores (UK/International), or your local Scheepjes stockist. Last Dance on the Beach starts on April 20, 2016. To join the CAL, please join the International (English speaking) or Dutch (Nederlands) Facebook groups. The patterns will be posted each week in the Facebook groups and on the Scheepjes website. I hope to see you all at the start of this crochet along in loving memory of Marinke. I am so thrilled that you will be doing this CAL on video. You helped me through Wink’s first one, which was my first CAL…so excited!! Thank you for doing this. So grateful that you take the time and care to make these video tutorials. Thanks to you, I’ve had success as a new crocheter (less than 1 year) with completing an ATB afghan and am almost finished with my Sophie. Looking forward to this next project. (It also pleases me that contributions will be made to a mental health organization. Family members have dealt with the effects of depression and these organizations can be a lifeline for someone in need.) Again…thank you and thanks to Scheepjes. I wanted to say thank you for the clear, pleasant and didactic guidance on Youtube. Thanks to you i enjoy learning and making. So glad you are doing this Esther – its a wonderful CAL and SO many people have joined the group and bought kits – over 1000 just in the UK. Wink will be very happy looking down on us all. I am following the Mandala Madness at the moment – I was SO grateful for that section on the two colour work = but maybe you could find some way of making me actually REMEMBER to carry the unused yarn along – grin!! !